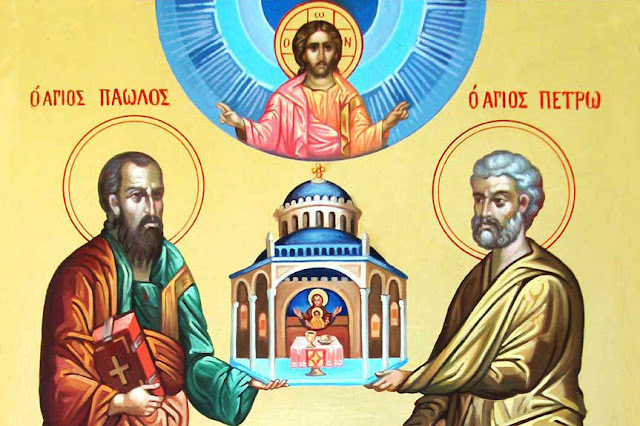 Eastern Orthodox Spirituality: Why the Apostles Peter and Paul Are Called The "Chief Apostles"
Why the Apostles Peter and Paul Are Called The "Chief Apostles"
As the word of God testifies, the Apostles occupy a special place in the Church—Let a man so account of us, as of the ministers of Christ, and stewards of the mysteries of God (1 Cor. 4:1). Vested with equal power from above and with equal authority to absolve sins, all the Apostles will sit on the twelve thrones next to the Son of Man (cf. Mt. 19:28). Although certain Apostles are distinguished in Scripture and tradition, for example, Peter, Paul, John, James, and others, none of them were chief, or even superior in honor to the rest. But because in the Acts of the Apostles the labors of the Apostles Peter and Paul are the most told, the Church and the holy fathers, while revering the name of each of the Apostles, call these two Apostles chief. Calling these two Apostles chief in rank and labors, the Church impresses upon us that its head is Jesus Christ alone, and all the Apostles are His servants (cf. Col. 1:18). The Holy Apostle Peter, who bore the name Simon before being called, was the elder brother of the Apostle Andrew the First-Called, and a fisherman. He was married, and had children. As St. John Chrysostom expressed it, he was a man who was fiery, unlearned, simple, poor, and God-fearing. He was brought to the Lord by his brother Andrew; when the Lord saw the simple fisherman for the first time, He named him Cephas, in Syrian, or Peter, in Greek, which means, a rock. After receiving Peter as one of the Apostles, the Lord visited his humble home and healed his mother-in-law of a fever (Mt. 1:29–31). Peter was vouchsafed by the Lord to be one of the three of His disciples to witness His divine glory on Mt. Tabor, His divine power at the resurrection of Jairus's daughter (Mk. 5:37), and His humiliation according to His human nature in the Garden of Gethsemane. Peter washed away his denial of Christ with bitter tears of repentance; he was the first of the Apostles to enter the Savior's tomb after His resurrection, and the first of the Apostles to be vouchsafed to behold the Risen One. The Apostle Peter was an outstanding preacher. The strength of his word was so great that he turned now three, now five thousand people to Christ. At the Apostle Peter's word, those accused of crimes fell dead (Acts. 5:5, 10), the dead returned to life (Acts 9:40), the sick were healed (Acts 9:3–34), even just by touching his shadow as it passed by (Acts 5:15). But he did not rank first in authority. All church matters were decided by the common voice of the Apostles and presbyters of the whole Church. When the Apostle Paul spoke of the Apostles who are honored as the pillars of the faith, he assigned first place to James, and then Peter and John (Gal. 2:9), and places himself amongst them (2 Cor. 11:5), comparing himself to Peter. The apostolic synaxis sends Peter to serve, just like the other Disciples of Christ. The Apostle Peter made five journeys, preaching the Gospels and converting many to the Lord. He finished his final journey in Rome, where he preached the faith of Christ, multiplying the number of disciples. In Rome, the Apostle Peter rebuked the deceit of Simon the magician, who was calling himself Christ, and converted two women, favorites of Nero. At Nero's command, the Apostle Peter was crucified on June 29, A.D. 67. He asked his tormenters to crucify him upside-down, wishing by this to portray a difference between his own sufferings and the sufferings of his Divine Teacher. Saul was educated in the Judaic Law, hated and persecuted the Church of Christ, and even requested authority from the Sanhedrin to find and persecute Christians. As for Saul, he made havock of the church, entering into every house, and haling men and women committed them to prison (Acts 8:3). One day, Saul, yet breathing out threatenings and slaughter against the disciples of the Lord, went unto the high priest, And desired of him letters to Damascus to the synagogues, that if he found any of this way, whether they were men or women, he might bring them bound unto Jerusalem. And as he journeyed, he came near Damascus: and suddenly there shined round about him a light from heaven: And he fell to the earth, and heard a voice saying unto him, Saul, Saul, why persecutest thou me? And he said, Who art thou, Lord? And the Lord said, I am Jesus whom thou persecutest: it is hard for thee to kick against the pricks. And he trembling and astonished said, Lord, what wilt thou have me to do? And the Lord said unto him, Arise, and go into the city, and it shall be told thee what thou must do. And the men which journeyed with him stood speechless, hearing a voice, but seeing no man. And Saul arose from the earth; and when his eyes were opened, he saw no man: but they led him by the hand, and brought him into Damascus. And he was three days without sight, and neither did eat nor drink (Act. 9:1–9). The stubborn persecutor of Christianity becomes an indefatigable preacher of the Gospels. The life, deeds, words, and epistles of Paul all witness to him as a chosen vessel of God's grace. Neither afflictions, nor want, nor persecution, nor hunger, nor nakedness, nor danger, nor sword, nor death could weaken the love in Paul's heart for God. He traveled continually in various countries in order to preach the Gospels to the Jews, and especially to the pagans. These travels were accompanied by amazingly powerful preaching, miracles, tireless labor, inexhaustible patience, and very holy life. The labors of Paul's apostolic service were incomparable. He said of himself, I laboured more abundantly than they all (1 Cor. 15:10). The Apostle endured countless sorrows for his labors. In A.D. 67, on June 29, he received a martyr's death in Rome, at the same time as the Apostle Peter's death. As a Roman citizen, he was beheaded by the sword. The Orthodox Church honors the Apostles Peter and Paul as having enlightened the darkness of the West; the Church glorifies Peter's steadfastness and Paul's wisdom, and sees in them an image of ones who sinned and corrected themselves: in the Apostle Peter—as one who denied the Lord and then repented; in the Apostle Paul—as one who resisted the preaching of the Lord, and then believed.